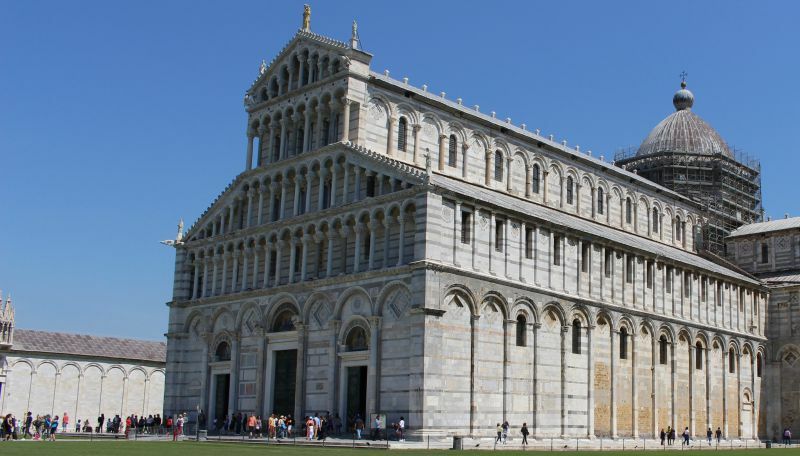 Pisa Cathedral (Duomo di Pisa) in the city of Pisa is one of the most significant masterpieces of Romanesque architecture in Italy. The church is dedicated to the Assumption of the Blessed Virgin Mary. 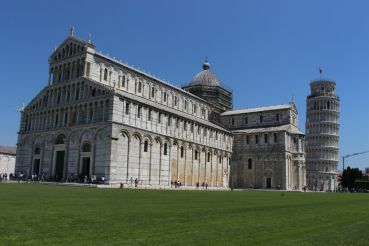 The Pisa Cathedral, together with the Tower of Pisa, the Baptistery and the Campo Santo Cemetery, is a part of an architectural complex located on the Piazza dei Miracoli, also known as the Piazza dei Duomo. Since 1987, the church, as well as other attractions of the whole complex, is included in the UNESCO World Heritage List. The construction of the church was started in 1064 and lasted until 1180. 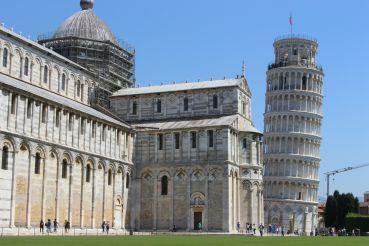 At that time Pisa was a strong seaside republic, and construction financing was largely carried out at the expense of military wins. The preserved inscription of the time on the façade of the cathedral is the evidence to it. The temple was consecrated by Pope Gelasius II on September 26, 1118. 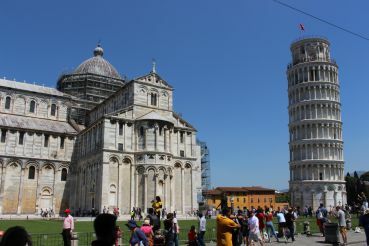 The construction of the cathedral can be divided into two periods. At the first stage the works were conducted under the guidance of the Italian architect Buscheto, he is also considered to be the author of the project. A basilica with a nave and four passing naves and a transept, consisting of a central nave and two side aisles were built at his time. A dome was built at the intersection of the naves. At the second stage in the first half of the 12th century, the architect Rainaldo designed the façade of the cathedral, which has survived to this day. In different epochs the cathedral was repeatedly reconstructed. 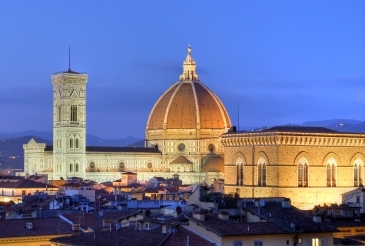 The largest reconstruction was carried out after a violent fire in 1595. 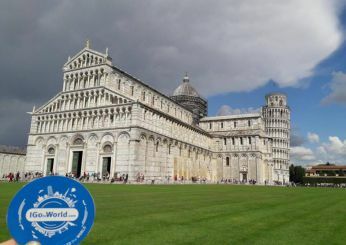 Originally, the Duomo di Pisa was erected in the form of a Greek cross with a dome at the intersection of rails. In the current plan, it is the cathedral with five naves and transept having three naves that resembles a Latin cross. 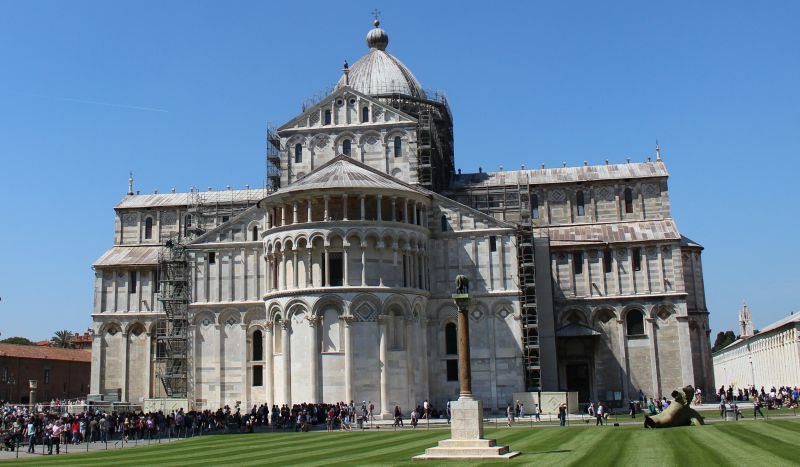 The architecture of the cathedral includes the stratification of elements of different styles – Classical, Lombard, Byzantine and even Arabic. 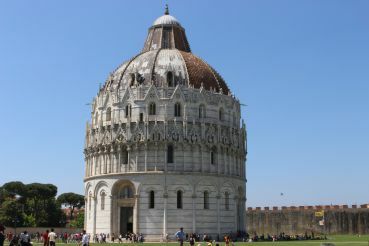 Later a similar style of construction was called the Pisa Romanesque style. Western side. This is the main façade, consisting of four tiers of external galleries-arcades, supported by columns. Material – gray marble, richly encrusted with various colored marble, also decorated with stone carvings and statues. The top of the pediment of the façade is adorned with a statue of the Madonna with the Child and four statues of the Evangelists on either side of it. At the bottom there are three doors made in 1602. The original doors were destroyed the fire in 1595. One bronze door by Bonanno Pisano (about 1180) survived. Now it is in the museum of the cathedral (Museo dell'Opera del Duomo). Eastern side. The top of the pediment above the apse is crowned with a copy of the bronze hippogriff – a mythical creature with bird's wings and beak, horse legs and lion's paws. 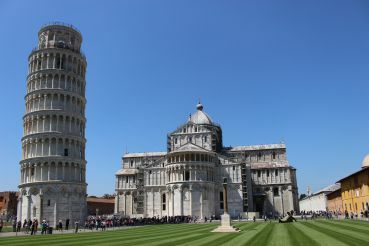 The statue was made by the Arabs around the 10th and 11th centuries, and Pisa probably got it like a military trophy. The original of the Pisa Griffin is kept in the museum of the cathedral. The original interior of the cathedral was largely destroyed by a fire in 1595. As a result, there have been significant changes in the interior decoration. Fortunately, a unique fresco survived in the apse. It depicts Christ with the Theotokos and John the Apostle. The fresco on the triumphal arch – the Madonna with the Child also survived the fire. Also the unique mosaic floors with the Cosmatheco style (mid-12th century) survived there. The interior of the cathedral is admirable – a sophisticated finish and rich decoration amazes tourists from all over the world. A lot of arches and the alternation of black and white marble create a sense of vast space. A high ceiling with the emblem of the Medici family is adorned with the gilding. The walls are decorated with Biblical paintings, written in the 15–16 centuries by Italian masters. 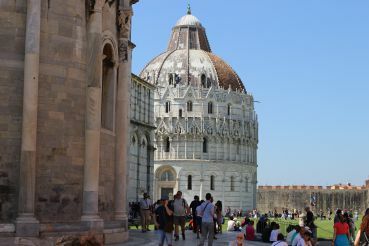 In the wall of the main façade to the left of the north door there is the tomb of the first architect of the Pisa Cathedral, Buscheto di Giovanni Giudice. The pulpit, executed by Giovanni Pisano in 1302–1310, is the best example of the Italian sculpture of the Proto-Renaissance and early Gothic. It was discovered only in 1926. Probably after the fire of 1595, for some reason, it was dismantled and not returned to its place. Today the pulpit has become a worthy decoration of the cathedral. It is worth paying attention to the chandelier for incense, hanging next to the dome of the cathedral – it is called the lamp of Galileo. According to legend, the nineteen-year-old Galileo being in the cathedral considered the swaying of the chandelier. As a consequence, he discovered the isochronism of small oscillations of the pendulum. Tomb of the Emperor Henry VII of Luxembourg, Emperor of the Holy Roman Empire. The work of the sculptor Tino di Camaino (1313-1315). A vase is placed on the right in the apse on the column, which was allegedly used at the Marriageat Cana. Then Jesus turned water into wine, and this was Jesus' first miracle. On the outer north side of the cathedral, to the left of the façade, at eye level, there is a piece of marble of Greek origin with numerous black dots. It is said that it is of the devil. When you try to count them several times in a row, each time you will get a different result. 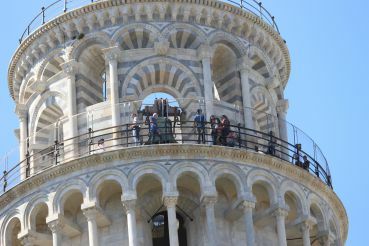 Granite columns of the Corinthian order, which are located between the nave and the apse, were brought to the cathedral from the mosque of Palermo. It is a military trophy of the Pisans after the attack on the city in 1063. The relics of Saint Rainerius, the patron saint of Pisa are stored in the cathedral. 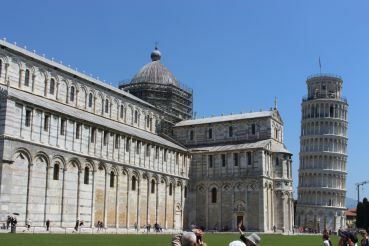 Pisa Cathedral is located in the heart of Pisa on Piazza del Duomo. You can take the bus № 4 or № 21. 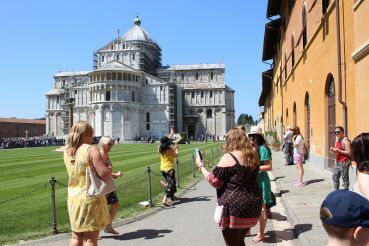 The entrance to the Pisa Cathedral is free. To visit you will be given a free ticket with a fixed time. If you buy tickets to other objects of the square, you can visit the cathedral at any time of its work. 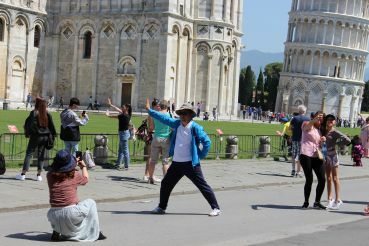 One of the attractions of the square is 5 euros. 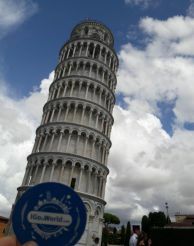 Leaning Tower of Pisa – 18 euros. 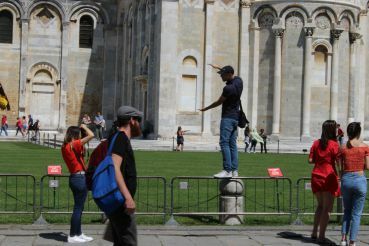 Visiting the Piazza del Duomo attraction is available every day. The entrance is allowed at 30 minutes before closing. 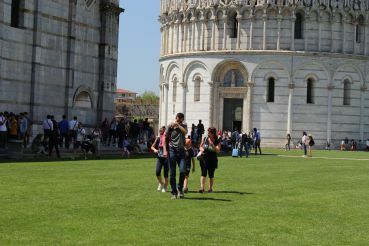 Visit to the Pisa Cathedral: from 10:00 to 17:00. Depending on the season, the opening hours can be extended. During the holidays, the cathedral is open for visitors from 1 pm, on 1 November to 4:30 pm. 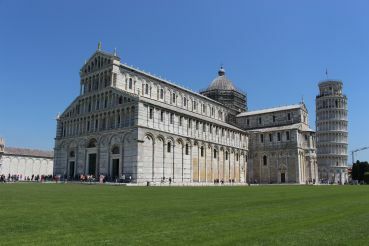 Pisa Cathedral is an active temple and services are regularly held here. Visitors are asked to wear appropriate clothing and behave appropriately. The cost of tickets and opening hours can vary.